This a basic setup of Universal Hyperbolic Geometry https://www.youtube.com/playlist?list=PL6ACFCC19EA82CA71, showing a projective point and its dual line in 3D with a z=1 viewing plane. 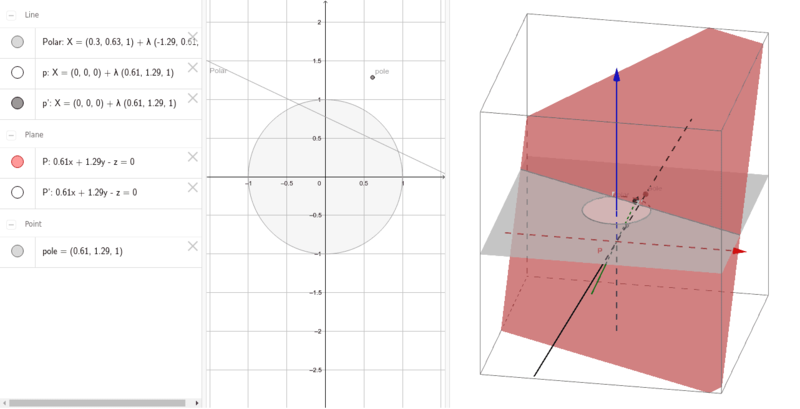 The point p and its dual P are determined by the pole, which can be moved around on the z=1 viewing plane. If you set its z coordinate manually to zero then it will be accessible on the 3D view. There's also some attempts to get from a projective point to a projective line and the vice versa (p' and P'). This is apparently not so easy in Geogebra because we can't just access the coefficients of these, and I'm also trying to avoid normalising the direction vectors to keep the exact original coefficients.